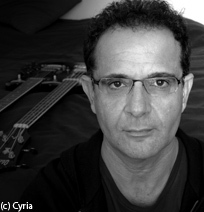 A French composer born October 26, 1956 in Alger. A self-taught guitarist and photographer, Eryck Abecassis settled in Paris in 1979 and took up cinema studies before turning definitively to music in 1981. A pupil of Julien Falk for harmony and counterpoint, he also studied orchestration at the CIM jazz school. In 1994 he took part in the instrumental research workshop at Ircam, and then, in 1997, followed the computer music course. His work is based on the notion of ‘noise music’, instrumental hybridisation and sound synthesis. His music, instrumental, vocal, electronic and mixed, is directed towards the theatre, the cinema, and also the street. Seeking out unconventional concert venues, Eryck Abecassis transforms the spectator into a musical inhabitant of the work. Leading an active career as an electronic musician and a composer, he appears throughout the world and has notably received commissions from the French state, Radio France, GMEM and Grame. His music, on the fringes of traditional trends, rejects any kind of modern academicism. His works include Blind (1997); Poupées-fantômes for piano, percussion, electronics and video, first performed in 2004 at Les Subsistances in Lyons; St Ferréol, an urban performance premiered in Marseilles in 2007 by 250 musicians; Sh-an, le chant des bruits, first performed in 2009 at Multiphonies of Radio France.